Sourakata Koité - en Hollande. Vinyl LP. Bleep. 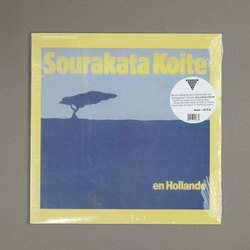 En Hollande is a 1985 LP from Sourakata Koité, a griot (musical storyteller) from Senegal. Working on the kora - a 21-string harp-lute instrument native to West Africa - Koité spins out a collection of elegant folk pieces. Instrumental numbers such as ‘Seremende’ revel in the sound of the kora, while ‘Moussa’ and ‘Dioula’ are ballads which pitch Koité’s clear-throated singing against propulsive musical backing. Even by the standards of Awesome Tapes From Africa this one is a gem of a reissue.